Earn 25,000 bonus points after you use your new card to make $3,000 in purchases within the first 3 months. Terms Apply. Overview: 25,000 bonus Starpoints® after spending $3,000 within first 3 months; Earn 2 Starpoints® for each dollar of eligible purchases spent on the Card at participating SPG® & Marriott Rewards® hotels. Earn 1 Starpoint for all other purchases. The Starwood Preferred Guest® Credit Card from American Express (a SmartAsset advertiser) caters to frequent travelers, in particular those who are regular customers of any Starwood-owned hotel, such as the St. Regis, W Hotels, Westin, or Sheraton. Upon signing up for this card, you’ll receive access to a variety of opportunities to quickly earn Starpoints® towards free nightly stays, free flights, and other rewards. For every dollar spent using the card (fees or purchases of cash equivalents like traveler’s checks are not included) Starwood will credit your account 1 Starpoint®, and for every dollar spent on eligible purchases at participating SPG® and Marriott Rewards® hotels you will earn 2 Starpoints®. Moreover, by spending $3,000 with the Starwood Preferred Guest® Credit Card within the first 3 months of opening an account, you will earn 25,000 Starpoints®. The Starwood Preferred Guest® Credit Card and Starpoints® also provide members with a number of travel amenities. First and foremost, for any Starwood stay booked directly through Starwood using your card, your room will be equipped with complimentary premium internet access. Similarly, becoming a card member gives you complimentary access to any of the 1,000,000 Boingo hotspots across the world on four of your devices. Using your Starpoints®, you can book free nights at any participating Starwood Hotel with no blackout dates (between 2,000 and 35,000 points per night depending upon the hotel). Furthermore, international traveling won’t cost you extra as there are no fees for international transactions. In summary, if you are a Starwood fan looking for extra savings when traveling and for a card with no annual fee in the first year, the Starwood Preferred Guest® Credit Card from American Express may be the right choice for you. Earn a $100 statement credit after you make $1,000 in purchases on the Card within your first 3 months of Card Membership. Plus, earn an additional $100 statement credit after your first purchase on the Card at a participating SPG® or Marriott Rewards® hotel within your first 6 months of Card Membership. 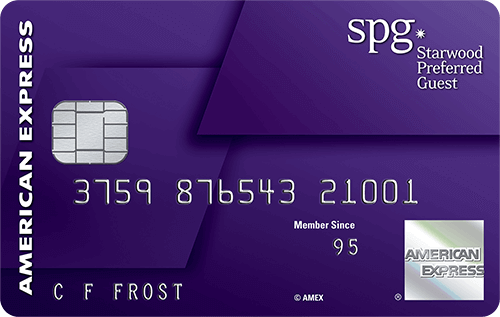 Note: On August 1, 2018, SPG will convert every one Starpoint in a loyalty member account to three points. In general, corresponding redemption changes will occur. Visit members.marriott.com for details. Effective August 1, 2018: Earn 6 points for every dollar of eligible purchases on the Card at participating SPG® and Marriott Rewards® hotels. Earn 2 points for all other eligible purchases. Redeem Starpoints® for free flights on on over 150 airlines with SPG Flights, all with no blackout dates. Transfer Starpoints to over 30 airline frequent flyer programs, mostly on a one-to-one basis. Receive a 5,000 Starpoint bonus when you transfer 20,000 Starpoints to a participating frequent flyer program. APR for Cash Advances: 26.99% Variable% variable. Returned Payment: Up to $null. Editorial Note: This content is not provided by the credit card issuer. Any opinions, analyses, reviews or recommendations expressed in this article are those of the author’s alone, and have not been reviewed, approved or otherwise endorsed by the issuer.